There's plants you can eat, and then there's plants you SHOULD eat. This one falls into the latter category. It's not because it's really good for you (which it actually is...), but that you're doing the world a favor by cooking with it. 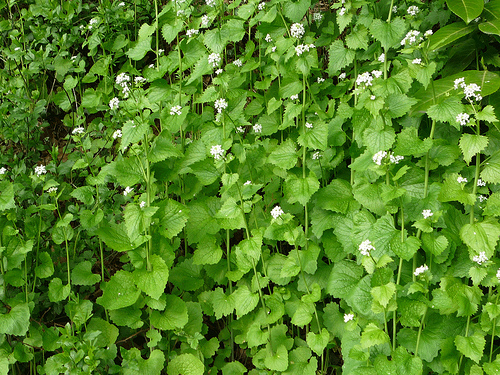 I'm talking about garlic mustard. And it is invasive. Terribly invasive. It's so invasive that it actually can choke out other beneficial species of plants in the wild – and in your garden. I've been fighting with this particular menace since I bought my house 15 years ago. It had kindly settled into my back garden. I believe we've called it a draw, as neither side is winning. 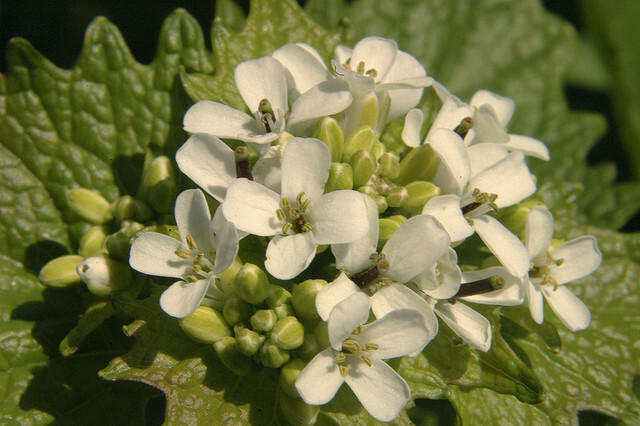 So what is Garlic Mustard? First off, it's much like it sounds. 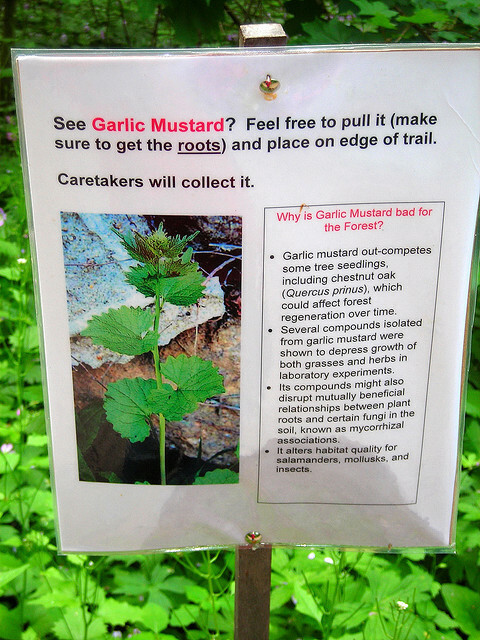 It has the flavors of both garlic and mustard plants. The leaves flowers and fruits/seeds are all edible although the leaves are best in the Spring when they're young. But you can still eat from the adult plant. Garlic mustard (Alliaria petiolata) is a biennial flowering plant in the Mustard family, Brassicaceae. It is native to Europe, western and central Asia, and northwestern Africa, from Morocco, Iberia and the British Isles, north to northern Scandinavia, and east to northern India and western China (Xinjiang). In the first year of growth, plants form clumps of round shaped, slightly wrinkled leaves, that when crushed smell like garlic. The next year plants flower in spring, producing cross shaped white flowers in dense clusters. As the flowering stems bloom they elongate into a spike-like shape. When blooming is complete, plants produce upright fruits that release seeds in mid summer. Plants are often found growing along the margins of hedgerows, giving rise to the old British folk name of Jack-by-the-hedge. 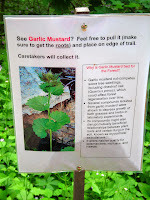 Other common names include Garlic Root, Hedge Garlic, Sauce-alone, Jack-in-the-bush, Penny Hedge and Poor Man's Mustard. The genus name Alliaria, "resembling Allium", refers to the garlic-like odour of the crushed foliage. Click on the image to read the sign. This common weed is tasty tossed with salad greens, made into pestos, steamed, simmered or sautéd, or wherever you would like their pungent, mildly bitter, essence of garlic. Garlic mustard was introduced to North America in the 1860's as a culinary herb. Big mistake, as the insects and larvae that prefer to eat this plant are not present in North America. Not even our deer populations will touch it, as they don't like the garlicky taste. 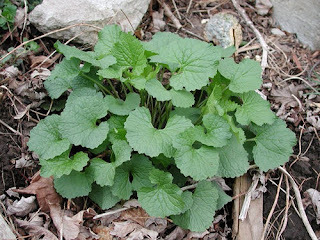 Instead they will eat the neighbouring plants that the garlic mustard is already crowding out. So nature gets a double whammy in North America. This plant has had a pretty free ride for over 150 years. I think it's time we did our bit to help Mother Nature. Let's all go out and make some pesto, or salad, or deviled eggs, or green yogurt, or mashed potatoes, or quiche, or pumpkin bread, etc. 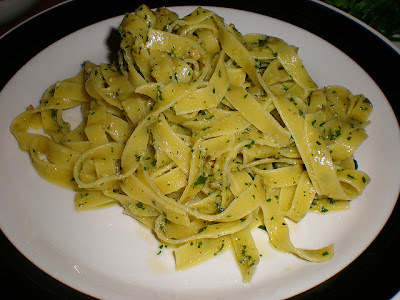 I found a site (HERE) with a list of over 40 great sounding recipes that use garlic mustard as an ingredient. So you have no excuse. Here's one more recipe that happens to not be from that site. 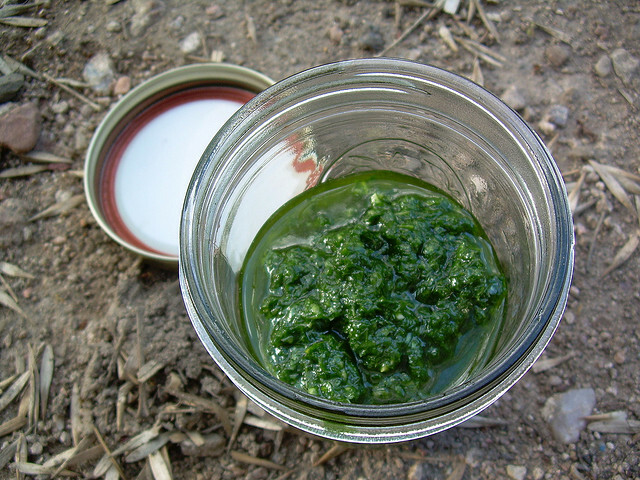 Garlic mustard recipes seem to be as prolific as the plant itself. Cook lentils in enough water to cover until soft. Drain off any excess water. While lentils are cooking prepare the pesto. In a food processor or blender combine all ingredients and blend until it forms a thick paste. Thin with additional water if necessary. Taste for seasoning and add salt if necessary. Combine hot lentils with pesto and serve with an additional grating of cheese if desired. Note: This pesto can be tossed on pasta, put on potatoes, or hard boiled eggs as well as used with the lentils as above. Be creative! If you like this post retweet it using the link at to right, or share using any of the links below. Garlic Mustard is growing in my front flower bed and while it is decorative and I do see it as beautiful green being I am aware of it's invasive nature here in North America. Nice to know that I can pull this plant with loving intention and try it as a salad green. My garlic mustard is coming up too. 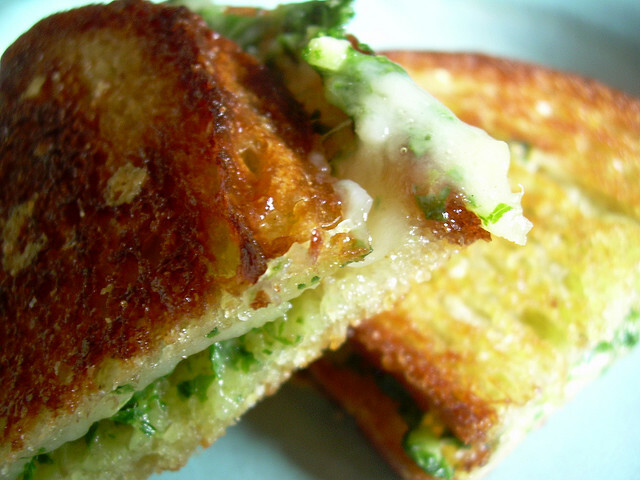 Soon time to maybe have a grilled cheese and pesto!